Video : Painted Blooms on Safari! 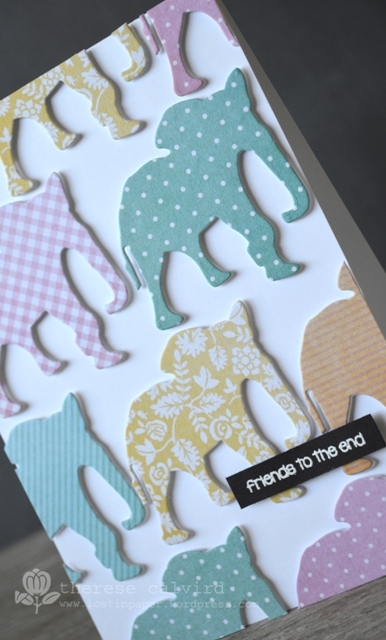 Me and my bright ideas, I really wanted to pop these elephants up and it would have made more sense and been so much easier to adhere them directly to the card front, but Oh No, so I did it and am so glad, love the subtle dimension… although next time maybe not lol. I’ve linked these fab products below or you can find them here at Penny Black. < Previous Video : It’s time to Colour with ‘U’! Next > Wish you were here! I really love how you designed this card and the patterns are so pretty, Therese! This is gorgeous, and what a fabulous idea! stunning card..you sure had a lot of work with the elephants..but the effect is so pretty! Therese, this card is so effective with the repetition of the die cuts – love it! If I may offer a tip for mounting ‘fiddly’ bits – try craft foam which now comes with adhesive on one side – die cut from this instead of white card, them use Tombow mono multi to adhere it to your card front. Easier than cutting those tiny bits of foam, and gives a very even surface. I’ve only just found out about this product, so you probably already know this! Thank you so much for your fab work! Sounds great Ann, I just got some recently from SB so will give it a go! Well worth all that effort – fabulous card, Therese. I use Ellen Hutson’s craft board for my dies – it is not adhesive, so you do use a lot of adhesive – very forgiving and gives your die cuts a lovely smooth finish. These elephants are totally cool. Love this design! Your card came out gorgeous, Therese! I love the paper and the elephants are so sweet! Love the sentiment…perfect for them! Great results for your efforts. Thanks for all the ideas on adding dimension. This is so cool Therese! This is fantastic what an awesome card! 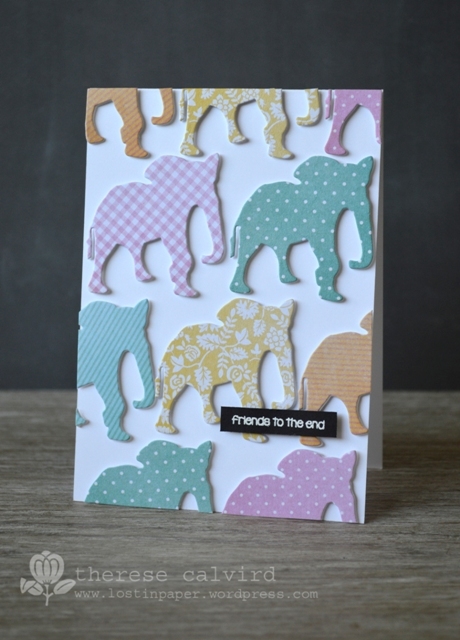 I love the elephants, such a cute pattern and the papers are so cute! Fantastic work. Love these elephants on parade! And your video! Such a sweet card. Might have to give this idea a go. Really wonderful card. Easter Blessings to you and your family. Love, love, love this card!! Isn’t it funny how the simplest idea’s can be the most effective. I think I might have to CASE this one (or add it to my list of cards of your’s that I would like to try…). I must tell you, Phoebe was just sitting beside me while I was watching the video. She thought your name was ‘Three’s’. I had to have a little giggle……. Wow this is gorgeous! I would never thinking of buying a diecut like that but oh I love the look of this card!! I thing the added dimension is certainly worth the effort!! This is a great way to showcase patterned paper (which I don’t use often enough!) I love your idea. Great card.